DIFFERENT imaging techniques offer different advantages to the researcher, and the holy grail of microscopy would be to combine all the benefits of the various techniques without any of their disadvantages. Linkam says that its new Cryo-Correlative Cooling Stage moves a step closer to that goal. 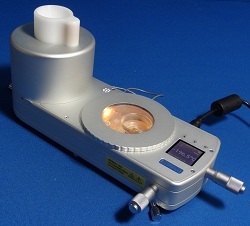 It says this imaging accessory represents a breakthrough for the imaging of cells at cryo temperatures, opening the technique of cryo-correlative light/electron microscopy or ‘Cryo-Clem’. Cryo-Clem correlates images captured with a cryostage on a fluorescent light microscope with images of the same sample observed by transmission electron microscopy (TEM). The correlative stage can hold samples at a stable temperature as low as -196C, enabling TEM grid samples to be studied at 100x magnification and facilitating the movement of these analysed grids to the TEM. There, areas identified as being of further interest can be examined more closely. The stage offers automated liquid nitrogen control, heated optics, and a digital temperature display to make this work easier for the research scientist. Dr Lucy Collinson of the London Research Institute (LRI) and Cancer Research UK (CRUK), is using the correlative stage in an international project studying cells expressing cancer-related genes. After assessment by might microscopy , samples are transferred and imaged in synchrotrons in Oxford, UK, Berlin, Germany, and Barcelona, Spain. Here the cells are imaged by soft X-ray tomography, an advanced technique for cell visualisation. Dr Collinson is working with Dr Sharon Tooze, head of the secretory pathways laboratory at LRI, to study cells that are undergoing autophagy (self-eating). The Tooze Lab studies proteins involved in autophagy by linking them to fluorescent markers and expressing them in cells. At the Diamond Light Source synchrotron in Oxfordshire, UK, a process has been developed to image the fluorescent proteins in cells as close to their living state as possible, bearing in mind that they are placed into a high vacuum for the very high magnification images. Cells are grown on very thin carbon films attached to a 3mm diameter gold grid, and frozen in liquid ethane at -174C. The correlative stage is used to image the fluorescence in the frozen cells, and the grids are then shipped to the synchrotron and placed into the soft X-ray microscope for 3D imaging. The researchers have already made discoveries about the autophagy process, and plan to apply this new knowledge to other important cancer-related projects.